The development of the Marcellus Shale has provided a job-creating and clean-burning supply of domestic energy – all while helping consumers save more of their hard-earned money throughout the region. Just ask Public Service Electric and Gas (PSE&G), a major power producer in the United States, which has been able to provide savings to its residential consumers in Pennsylvania thanks to affordable and abundant natural gas supplies. Same goes for UGI Utilities, which recently confirmed that thanks in part to the Marcellus, “customer bills have dropped more than 30 percent” over the past five years. Other Northeastern states are also looking to take advantage of this affordable energy supply. As a recent study from the Maine Governor’s Energy Office highlighted, New England electricity customers could save over $1.5 billion per year by adding natural gas capacity from affordable sources like Pennsylvania’s Marcellus Shale. Those savings would be a welcomed change for the thousands of residents across the Northeast who continue to battle the winter cold while often struggling to keep their monthly energy bills down. 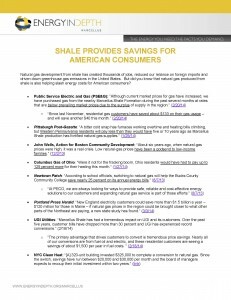 Check out EID’s latest fact sheet – Shale Provides Saving for American Consumers — to learn more about how hydraulic fracturing and the development of the Marcellus Shale are helping consumers across the region save money this winter season.